Harvest time is the best time! 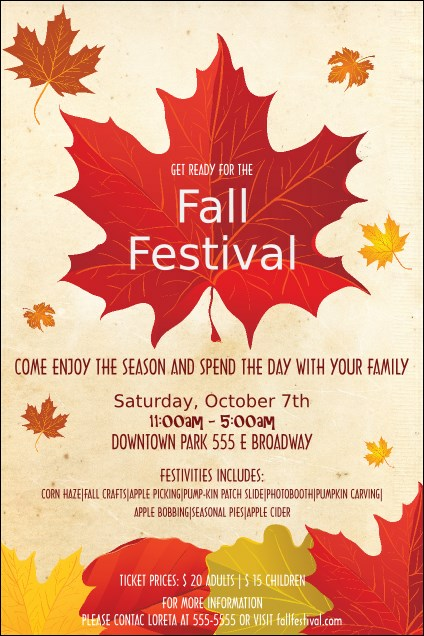 Get the word out about your fantastic festival with the Fall Leaves Poster. Its brightly colored foliage, parchment background, and apple-cider-hued typeface come together to present your event in the very best seasonal light. Add celebration details to this template and instantly transfer it to any other product, including this design’s matching event tickets, invitations, and more. Measurements are 11.46" x 17.18"
Bring your event to the forefront and draw a crowd with custom printed event posters. Browse hundreds of designs on TicketPrinting.com.